Valparaíso is a major city, seaport, and educational center in the county or commune of Valparaíso, Chile. It's known for its steep funiculars and colorful, clifftop homes. 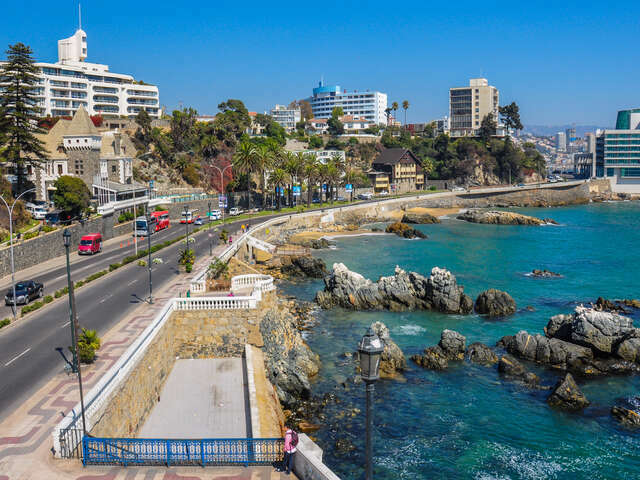 Valparaíso played an important geopolitical role in the second half of the 19th century, when the city served as a major stopover for ships traveling between the Atlantic and Pacific oceans by crossing the Straits of Magellan. Valparaíso mushroomed during its golden age, as a magnet for European immigrants, when the city was known by international sailors as "Little San Francisco" and "The Jewel of the Pacific". In 2003, the historic quarter of Valparaíso was declared a United Nations Educational, Scientific, and Cultural Organization (UNESCO) World Heritage Site.